MyLab™ Math is an online homework, tutorial, and assessment program designed to work with this text to engage students and improve results. Within its structured environment, students practice what they learn, test their understanding, and pursue a personalized study plan that helps them absorb course material and understand difficult concepts. 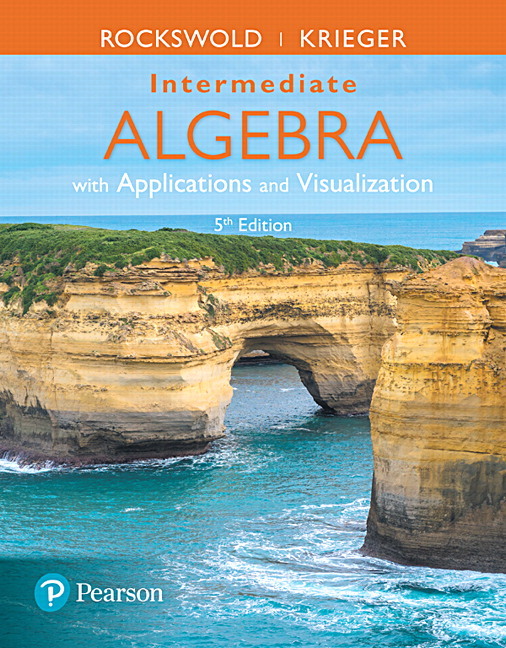 The 5th Edition continues to help students develop conceptual understanding and bring key concepts to life with content and assignments that reflect the authors’ approach, including new Section Introduction videos and See the Concept videos with assessment. New Skill Builder assignments offer adaptive practice to build students’ foundational skills, and new workspace assignments allow students to show their mathematical reasoning as they progress step-by-step, with specific feedback at each step in the problem-solving process that adjusts to their path. Experiencing Math in Context: Rockswold/Krieger’s unique approach presents students with the math in context first, before explaining the abstract mathematical theory behind it. This gives students a familiar and concrete foundation to build the concepts on. Math in the context of the real world is emphasized throughout—-both to engage students’ interest, and to help them grasp mathematical concepts through tangible applications. NEW! Guided Workbook is keyed to the text by section and objective and leads students through the course, giving them the opportunity to record key information, work practice problems, and show and keep their work for reference–as well as taking conceptual understanding one step further by asking students to explain Why? after select questions. NEW! An Integrated Review MyLab Math course is an alternate version of the MyLab Math course that provides the full suite of supporting resources for Intermediate Algebra, plus additional assignments and study aids for students who will benefit from remediation on prerequisite topics. Assignments for the integrated review content are preassigned in MyLab Math, making it easier than ever to create your course! An Integrated Review MyLab Math course is an alternate version of the MyLab Math course that provides the full suite of supporting resources for Intermediate Algebra, plus additional assignments and study aids for students who will benefit from remediation on prerequisite topics. Assignments for the integrated review content are preassigned in MyLab Math, making it easier than ever to create your course! 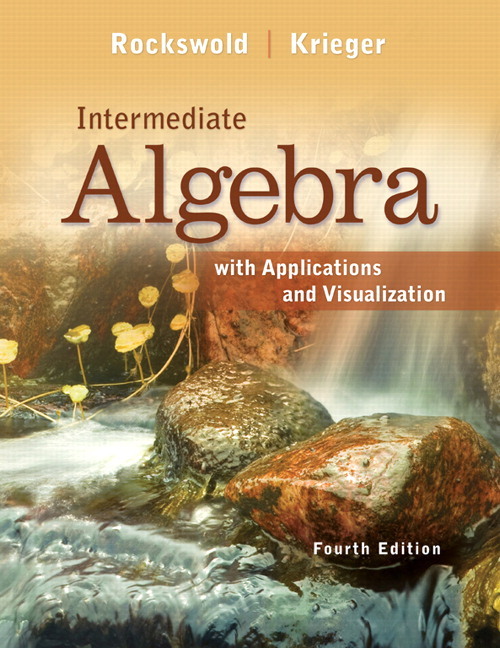 Intermediate Algebra Content Changes: In addition to new and updated features, the following refinement of content has taken place for the 5th edition. Chapter 1: Exercise sets thought the chapter have be reorganized to match more closely with MyMathLab Objectives. Increased coverage of reading line graphs has been added to section 1.5. Chapter 2: New graphics and visuals have been inserted throughout the chapter to enhanced understanding of linear functions. The midpoint formula is now covered in Section 2.2. Several new examples and exercises have been added to demonstrate the use of linear functions in real world context. Chapter 3: There is a renewed focus in this chapter emphasizing the use of linear equations in real-world context. A new subsection covering Piece-wise Defined Functions has been added to Section 3.4. There is also increased content related to graphing absolute value functions by hand. Chapter 4: Exercise sets thought the chapter have be reorganized to match more closely with MyMathLab Objectives. New graphics and visuals have been inserted throughout the chapter to enhance understanding of systems of linear equations. Chapter 5: As requested by a user, there is now increased coverage of using the graph of a parabola to write quadratic functions in factored form. Chapter 6: At a user’s request, more speed/rate exercises and “working together” exercises have been added. Chapter 7: The coverage of using zeros to write the formula for a function was expanded in Sections 7.5 and 7.7. Chapter 8: A new graphical description for deriving the formula to find the vertex of a parabola is now included. Also, a real-world example was added to highlight a common situation in which a quadratic equation might have zero, one, or two solutions. This chapter additionally includes increased coverage of complex solutions to quadratic equations. Chapter 9: A discussion connecting social network posts with half-life and exponential decay is now included to give students a relevant and accessible example of this important concept. At the request of reviewers, we expanded the coverage of changing between exponential and logarithmic forms of equations. Chapter 10: New exercises involving the equation of a circle were added. Chapter 11: In this final chapter, the coverage of writing a formula for a sequence from given terms of the sequence was increased.